I’ve always been a big fan of neon signs (I even have a vintage one in my apartment!). There’s just something about the bright colors that is straight magic. 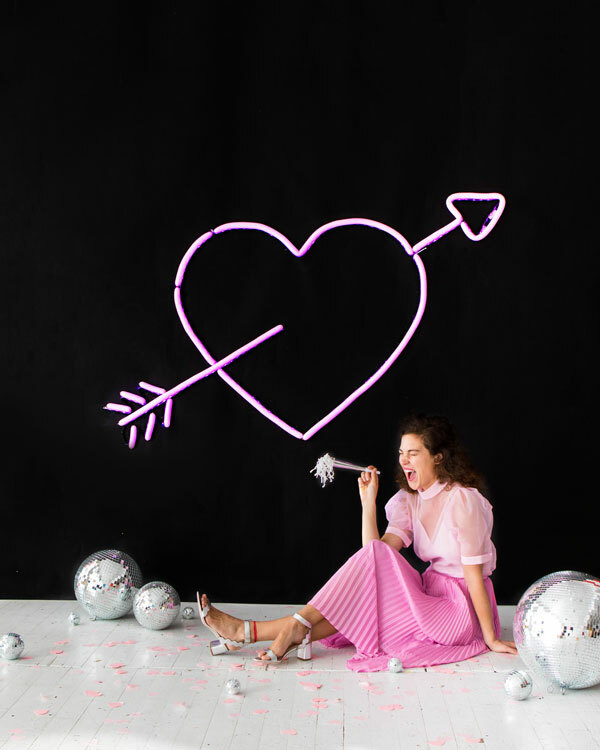 As it turns out, I’m not the only neon fan in the Oh Happy Day studio, and a bunch of us got the crazy idea to do a “neon” heart balloon backdrop! We were inspired by the neon sign costume we created for Halloween to make a larger version that could be used for a party! It actually glows! Scroll down to see how we did it! 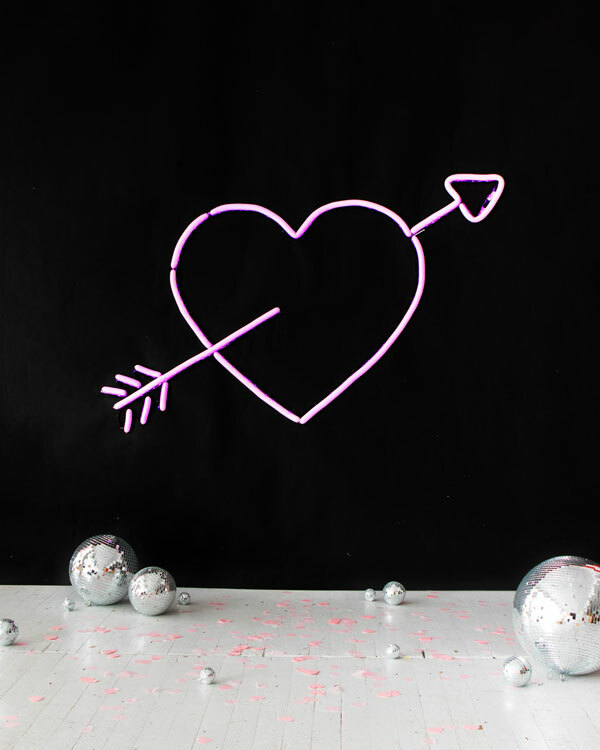 Step 1: Project an image of a heart and arrow onto a large blank wall. Lightly trace the outline with a pencil. Step 2: Starting with the end of the LED strip that connects to the battery box, position the LED strip along the design outline. Secure the back of the LED strip to the wall with gaffers tape. Add more tape as you go, until you reach the end of the strip. Step 3: Repeat with more LED strips until your design is complete. Step 4: To make the end of the arrow, create a zig-zag shape for both sides with the LEDs along the sides, then feed the LED under the topmost section and up to form the shaft of the arrow. Use black gaffers tape to cover the parts of the LED strip where you do not want lights to show. Step 5: Inflate 160Q balloons. Release a bit of air from each balloon before knotting so the balloon has less tension, then trim off the balloon tails. To make balloons to size, inflate a balloon to the length you need, knot both ends, and trim off the leftovers. Step 6: Apply pieces of Shurtape along the outline of the design and attach balloons. Step 7: Insert batteries into the battery boxes, then extend the battery boxes outside of the design and tape to the wall. Turn on the LEDs and you’re all set! This is fabulous! 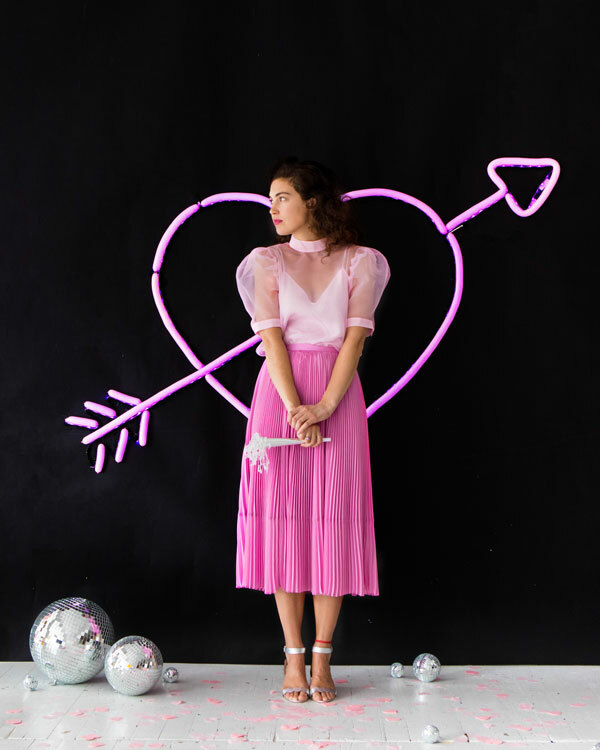 Great idea for a Galentine’s Day Party! I seriously love this idea! 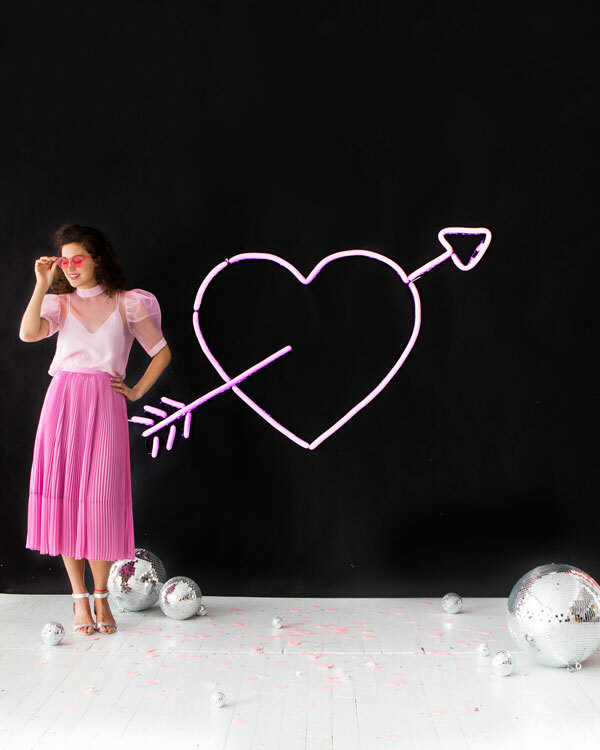 I too am such a huge huge fan of neon signs – especially pretty pink ones like this! Such a cool idea I really want to try out. This is absolutely amazing! Does the lighting get hot or anything? I feel like I need to just have this on my wall for no reason! This is amazing! You guys are so creative!